As the US Open kicked off Monday night (Aug. 27) at Arthur Ashe Stadium in Flushing, N.Y., Kelly Clarkson was on hand to deliver a rocking opening ceremony performance — and it may just be her ticket to the 2019 Super Bowl. Clarkson was only on stage for about 10 minutes, but delivered six of her biggest hits, including «Since You Been Gone,» «Miss Independent» and «Stronger (What Doesn’t Kill You).» Though the tennis stadium wasn’t the best for concert audio, Clarkson’s voice carried far and wide, with the singer also utilizing practically every inch of the court for her short but stunning performance. And now, fans are calling for her production to be brought to Atlanta for Super Bowl LIII next year. That seemed to be the general consensus across Twitter following Clarkson’s US Open performance, with some even taking action to get the attention of halftime show organizers using retweet petitions and tagging the NFL. Clarkson hasn’t addressed the Super Bowl campaigning yet, probably because she’s still buzzing from being in the same place as tennis’ queen: «I love opening for Serena Williams,» she joked after her performance. Check out some of the Kelly Clarkson Super Bowl wishes and a clip of her performance below. Drake’s «In My Feelings» Challenge has taken over the internet. With everyone from Will Smith to Drizzy himself hitting the viral challenge, there’s bound to be a few failed attempts. From running into street signs to getting locked out of a moving vehicle, these bloopers range from hysterical to downright dangerous. Alot can go wrong when hopping out of a moving car to hit «the shiggy,» but there’s no sign of the challenge slowing down anytime soon. Check out the epic fail posts below. If you thought Fergie’s instantly iconic take on the National Anthem at the 2018 NBA All-Star game was amazing, wait until you see what the folks at Bad Lip Reading have for you. As a gift to the nation on the 4th of July holiday, the team unleashed their remixed version of Fergie’s already unique performance with some even more one-of-a-kind vocalizations. 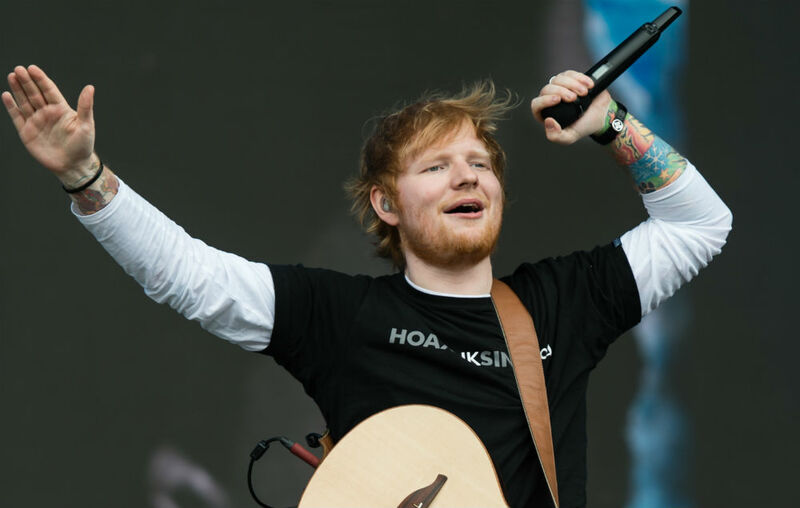 Ed Sheeran has spoken further about his now-infamous gig in Cardiff which he had to interrupt twice to go to the toilet. 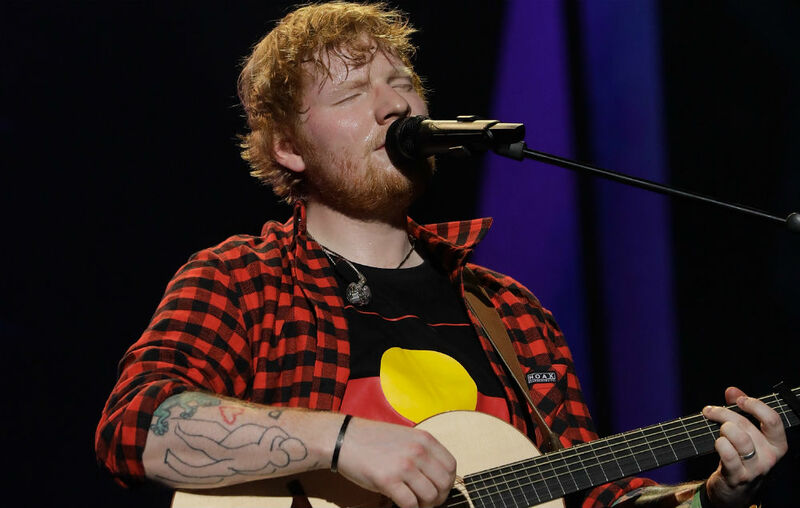 Sheeran was quizzed about the gig during his upcoming guest appearance on The Big Narstie Show, which premieres on Channel 4 on Friday (June 29) at 11pm. “Yeah, you know what, I’ve never done that before,” Sheeran told Big Narstie and his co-host Mo Gilligan about the gig. “You know when you gotta go, you gotta go. I thought interrupting a show to be like, ‘I’m going off stage’ is far better than a picture in the paper the next day. “But I was only off stage for like a minute. I’ve never done it, I’ve never stepped off stage to do that before. “So I was there, I was playing, I was singing – but it was getting worse and worse and worse; you know when you start sweating?” he continued. Last week, Sheeran donated a life-sized Lego model of his head to charity. James Corden enlisted help from Beatles crooner Paul McCartney for The Late Late Show’s London edition of «Carpool Karaoke» Thursday night. Hoping to find someone to accompany him during his drive, Corden calls McCartney on the phone during the segment, comically reciting infamous Beatles lyrics to the singer. «I need somebody, not just anybody. Can you please, please help me,» Corden begs. After joining the late-night host, the two fittingly kick things off with a karaoke renedition of the Beatles’ hit «Drive My Car,» where McCartney takes the driver’s seat at various points throughout their performance. During their drive, the singer chronicles the origins of his career, revealing that he wrote his first song at age 14. «Your music is so full of positivity and joy and a message of love and togetherness, I feel like it’s more relevant now today maybe than it’s ever been,» Corden tells him. McCartney agrees, saying, «We expected it to last 10 years, but it keeps going on, and on, and on. And it keeps being relevant.» McCartney also shares that his mother’s motivating message to «let it be» inspired the song that would grow to become a Beatles classic. Corden becomes emotional after singing a duet of «Let it Be» alongside the music legend, and the car ride becomes more sentimental as McCartney takes a trip down memory lane, showing the late-night host a tour of his former home and walking him through places where he and John Lennon wrote some of their iconic hits. It doesn’t matter how famous you are, no kid ever wants to see their parents naked and in bed together. This month Beyonce and JAY-Z kicked off their On The Run II Tour and in addition to putting on some epic performances, the power couple is also presenting intimate glimpses into their lives through video interludes shown in between songs. The footage contains home videos of the Carters with their kids, daughter Blue Ivy and twins Rumi and Sir. Obviously fans are excited to see the never-before-seen content. Well, most of them. Blue Ivy? Not a fan. After audience members captured the six-year-old’s reaction: covering her eyes, ducking, making faces, etc., the videos went viral all over Twitter making the cringe all the more hilarious and relatable. Esta semana el mundo se detuvo con la sorpresiva colaboración de Justin Bieber para un remix del éxito del momento: Despacito. ¿Lo particular?, es escuchar al ídolo canadiense en el tema de Lusi Fonsi decir «pasito a pasito, suave suavecito» en un español que hace reír a muchos, mientras que otros aplauden el gran esfuerzo de Bieber en hacerlo. 10. La pasión de Nelly Furtado por cantar en español comenzó en el 2002 con Fotografía junto a Juanes; luego en 2006, en No Hay Igual con Calle 13, hasta que en 2009 lanzó un disco completo en el idioma.Aunque admiramos cómo mejoró, tenemos que reconocer que su inicio no fue del todo fluido. 9. Solo Otra Vez, de Celine Dion fue suficiente para que no queramos escucharla más cantando en español. 8. Las boybands de los 90s quisieron retribuirle algo de cariño a sus fans latinas, entonce tuvimos cosas como Yo Te Voy a Amar de NSYNC y esto: Nunca te Haré Llorar de Backstreet Boys. 7. En el 1997, Robbie Williams hizo que deseáramos que nos viniera a buscar con demonio cuando estrenó el tema Ángel. 6. En el 2013, Laura Pausini no se la puso fácil a Kylie Minogue cuando la puso a cantar «Y será quizás incomprensible pero no seré como querías tú, no seré inevitablemente todo lo que piensas tú» en el tema Limpio, para el cual trabajaron. 5. Mariah Carey siempre se ha encargado de llevar al frente su herencia latina por parte de su abuelo venezolano. Sin embargo, parece que la facilidad para el español ni vino en sus genes. 4. Un clásico infaltable: Cama de Rosas, de Bon Jovi. 3. Cuando se dice que Michael Jackson lo hizo todo, eso también incluye esta versión en español de I Just Can’t Stop Loving You, que dejó mucho de desear. 2. Gracias ABBA, pero era totalmente innecesaria esta Reina del Baile, la versión en español de Dancing Queen. 1. Debemos confesar que nuestros oídos tuvieron una recaída cuando volvimos a escuchar Girlfriend de Avril Lavigne en español. Merece el primer lugar de esta lista, y con honores. The confusion over whether rapper Childish Gambino and actor/comedian Donald Glover are two different people continues, this time baffling Cardi B. Last week, in a now-deleted tweet, the Invasion of Privacy rapper seemingly made an astute observation before quickly realizing she was incorrect. «It’s amazing how Donald Glover and Childish Gambino look soo much alike. I think they secretly the same person!!! Soo dope! !’» Cardi wrote Thursday (May 24). It’s uncertain whether Cardi was making a joke or being serious. Either way, her comments about Gambino and Glover — who are the same person, for the record — inspired some of her social media followers to share their own experiences with the matter. «The movie hasn’t started yet but there’s no way any part of Solo is going to be better than the guy LOSING HIS MIND outside the theater realizing Childish Gambino and Donald Glover are the same person,» one Twitter user wrote, referencing Glover’s role as Lando Calrissian in the latest Star Wars film, Solo. And Cardi, just so you know, Donald Glover isn’t the son of veteran Lethal Weaponactor Danny Glover. Who runs the world? Blue Ivy Carter. While the 6-year-old’s parents JAY-Z and Beyoncé are world-famous performers, members of the extended Knowles-Carter clan have said on multiple occasions that Blue is the star who actually runs the show. She’s adorably kept all eyes on her with Instagram fashion shows, awards-show antics and, most recently, correcting grandma Tina Knowles on ballet etiquette. Here’s a look at six of Blue Ivy’s sassiest moments. Beyoncé’s Instagram is full of adorable Blue Ivy photos — Halloween costumes and Grammy appearances included. A throwback photo from Bey’s feed shows her when she was just 4 years old getting into mom’s makeup bag to apply gems, cat-eye liner, and a pink lip to her face. Blue made her musical debut when she was just a few minutes old, when her heartbeat and cries were featured on JAY-Z’s 2012 single «Glory.» A few years later, she followed in dad’s footsteps and freestyled on a bonus track from his 2017 opus 4:44. During Camila Cabello’s moving speech at the 2018 Grammys, Beyoncé and JAY-Z applauded the moment along with the rest of the audience. The camera held on the family long enough for everyone to see Blue quieting the commotion by shushing her mom and dad, which has resulted in a meme for the ages. Tina Knowles’ second annual Wearable Art Gala took place in March, and the whole family was in attendance. During the art auction, Blue raised her paddle more than once to prove she knew a thing about live bidding. At one point, she successfully bid $17,000 on a painting of Sidney Poitier but when the price was raised a couple thousand dollars, Jay hilariously intervened and tried to take the paddle away. Shortly after, Blue managed to snag a work of art for $10,000. JAY-Z recently opened up to David Letterman about his career and family in an episode of Netflix’s My Next Guest Needs No Introduction. During the chat, the rap mogul shared an anecdote of him rushing an inquisitive Blue to get in the car for school, which resulted in her explaining how she felt about the exchange. «Dad, I didn’t like when you told me to get in the car the way you told me. It hurt my feelings,» she said. Her emotional maturity left JAY-Z in awe. Miss Tina, the Knowles family matriarch, has shined on Instagram with her relatable posts and endearingly corny jokes. On Wednesday, she shared with her followers a peek of her attending The Walking Ballet in Paris, but was soon exposed by Blue for taking photos inside the venue. «You’re not supposed to take videos, grandma,» the 6-year-old warned. Miley Cyrus has carried out a hilarious prank aimed at scaring Jimmy Kimmel. As part of the episode of Jimmy Kimmel Live! that aired on Monday night (21May18), the TV host shared that his wife Molly McNearney and the popstar had teamed up on an elaborate stunt. «For whatever reason, I have become the victim of an unusual prank multiple times,» Jimmy introduced the clip, before going on refer to prior pranks carried out by Rihanna and Britney Spears in which they woke him up during the night. The footage then showed Miley entering Jimmy’s house dressed as a construction worker, before entering his bedroom and jumping on his bed with a pretend sledgehammer, with a friend dressed up in a wrecking ball costume, also joining in. However, the prank took a bit of a painful turn for Jimmy when Miley accidentally hit him with the sledgehammer in a particularly sensitive spot. Rihanna pulled off a late-night April Fools’ prank on a sleeping Jimmy in 2015 where she sneaked into his house to perform her song B**ch Better Have My Money, while a year later Britney broke in and did a dance routine with a group of her dancers.